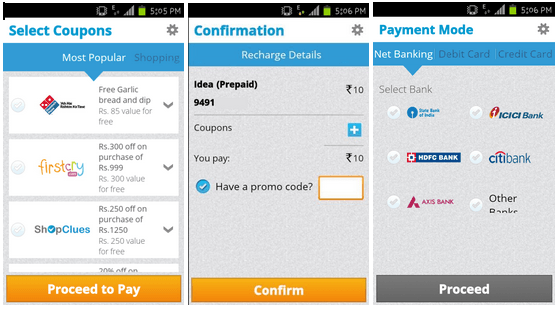 Last year I covered a review of the Online Recharge Site – Paytm. As the technology is tending more towards mobiles and tablets every day the need for a mobile Application with respective web services is also increasing and so did Paytm with their Mobile App as a solution for Android platform. 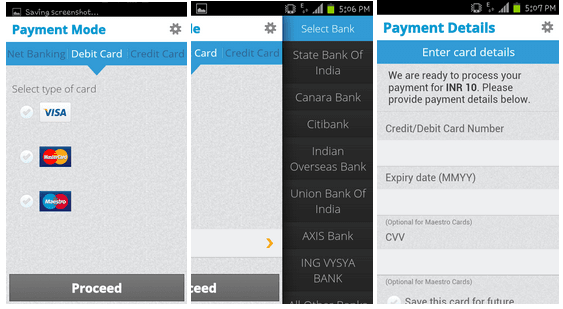 Though an app of Paytm is previously available, it lacked many features but it’s not the case with newly launched app. What facilities can we avail with this app? The application automatically detects the Mobile operator while entering the number as long as you have not availed MNP facility previously on that number. 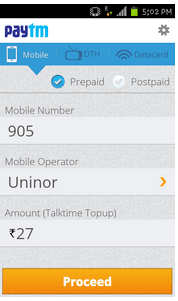 If you have availed MNP please reconfirm the Mobile Operator and proceed with Amount. Once after you logged into your account you can directly use Paytm cash. You can even get some support for any problems or confusions arising in using the app through the Help section of the app. For Coupon Lovers: Those who love to get benefitted with some exta Toppings adding value to their money can now select coupons of their wish from the listed coupons in a similar way you can on Website.Select your copons and proceed to payment where you can confirm and add any promo code. Payment Mode: More Payment options are added unlike previous app which used to fail with debit payments which included a 3D secure pin feature. Now within the app itself you will be redirected to WebPages where you need to enter any within the bank pins or passwords for payment confirmations. You have got Net Banking (All major banks though some are missing will be added soon), Debit Card and Credit card as various payment mode options including Paytm cash. In case of failed transactions you have also got a page that will confirm you a retry of the same recharge or proceed with a fresh recharge by editing the previously entered details making the app a recharge destination from Paytm for Android platform. You can access Mobile version of Paytm on any Mobile browser using m.patm.com and experience the power of Top Up on the go. What I found is missing? 1. As soon as i started using the app the very first feature i found missing is the essence of Paytm’s more demanding feature – Top up or Special Recharge option which is available in the previous version of the app is not available in the latest version. 2. Ability to add Paytm cash within the app is also missing. You need to access web again to add Paytm cash to your account. I hope the missing features will be added immediately in any pipelined update, Paytm are you listening? 3. Home, back, start a fresh recharge, exit buttons are also missing which are a bit irritating. So, as of now you can TOP Up any Mobile within the app as the Special Recharge option is missing, i even have not tried it. You can download this free Paytm Android app from Google Play. Have you used this app, if so what’s your experience with it? Hmm I must say the app looks good but then this is not a beauty contest 😉 very optimistic about the app but when the backend is technically incompetent (multiple failed transactions) and the customer support is sloppy & pathetic (they always feel ‘terrible’ at any email) does it really matter ! !